This is a brand new, with tags, authentic Tampa Bay Devil Rays 1970s style COOL BASE Turn-Back-The-Clock jersey. This is the throwback jersey that Majestic made to look like what they thought a Rays uniform would look like in the 70's if they played back then. They did wear this style jersey for one throwback game last year. It is made by Majestic and is a size 56(3XL). The jersey has the crest sewn on in tackle twill along wit the sleeve patch. This is a super sharp looking jersey that is VERY hard to find. WE SELL ONLY OFFICIALLY LICENSED JERSEYS MADE BY TOP MANUFACTURERS! IF WE CALL IT AUTHENTIC, THEN IT IS AUTHENTIC!! You can be sure all of our jerseys are the real deal. 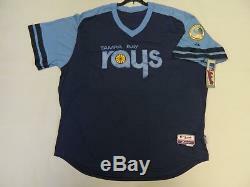 The item "Authentic Tampa Bay Devil Rays 1970s Throwback TBC COOL BASE Jersey 56 RARE" is in sale since Wednesday, September 9, 2015. This item is in the category "Sports Mem, Cards & Fan Shop\Fan Apparel & Souvenirs\Baseball-MLB". The seller is "ptfsports" and is located in Parsippany NJ. This item can be shipped to United States.